Watching Star Trek made me think of a few "deeper" questions about Starfleet, which are all related to the Star Trek TV series. So, let's take for example the Dominion War: people are dying every second, ships get destroyed and cadets are still joining although they know they are probably going to die unless they are with Picard or Sisko. As I read and got to understand, money has no value anymore, latinum is the general trading currency in the universe. But people on Earth don't trade and don't earn their paychecks. Earth is a much better place than today and yet young boys and girls from every culture/civilization are joining Starfleet as they are willingly signing their death note. Why are they joining, what motivates them? They might know that they're probably going to die. They don’t earn paychecks. They could be doing any other job, yet they choose this. And what's more interesting how many died on battlefields must be lined up in front of StarFleet every day? What do they receive after service? Why are they doing it other than preserving their homes? The Star Trek world is based on a post scarcity economy, which this article explains nicely. My guess: because you are born in a place where all your basics are covered up until almost the top of the pyramid, what is left is just self-actualization. What could be better for that than to explore the universe? I would sign blindly if I were there. 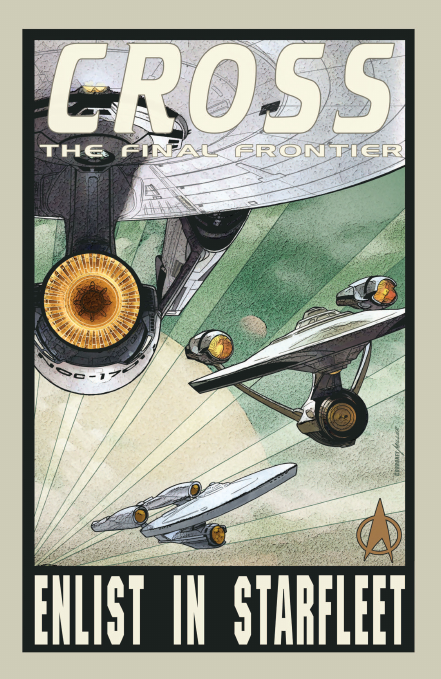 Keep in mind that the Star Trek series only cover the intensive events: they won't cover an episode about a routine space exploration with no contact whatsoever, or we would fall asleep ;-). I think they simply receive the feeling of having some meaningful stories in their lives + an awesome experience in the unknown! It's in us, otherwise why the **** did Columbus decide to get into so much trouble? PICARD: The acquisition of wealth is no longer the driving force in our lives. ...We work to better ourselves ...and the rest of humanity. JANEWAY: Shannon O'Donnell inspired me when I was a girl. She had an influence on my imagination, on my goals. SEVEN: I never realised genealogy could have such an impact. JANEWAY: I wouldn't have become a Starfleet Captain if it wasn't for her. ISHARA: So Tasha took care of me. And when I got old enough, I joined the Coalition. DATA: And Tasha did not? ISHARA: My sister hated the cadres. Blamed them for our parents death. For everything. She refused to join. And she left [to join Starfleet] as soon as she had the chance. WORF: I was rescued from Khitomer by humans. Raised and loved by human parents. I've spent most of my life around humans, fought beside them. SOONG: I gave you the ability to choose whatever you wanted. To do whatever you wanted. 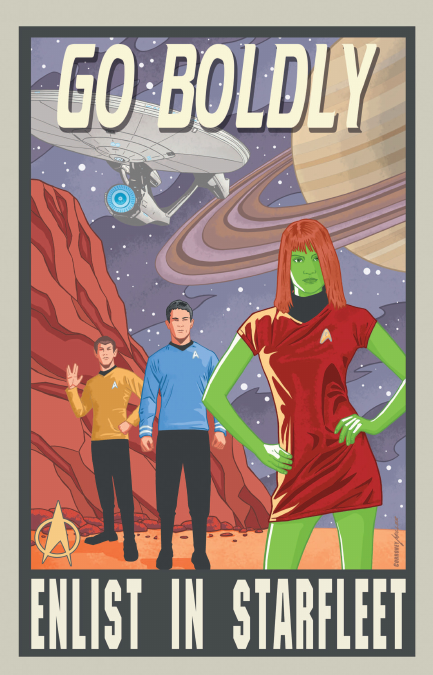 Why Starfleet? DATA: It was Starfleet officers who rescued me. SOONG: Ah. So you decided to emulate your emancipators, huh? How disappointing. Saru: Every story I heard created a space inside me to feel more, to love more. I joined Starfleet to help those in need the way I was helped. FAJO: A military pacifist. What a marvelous paradox. Tell me - whose dreadful decision was it to enlist you in Starfleet? SCIENCE MINISTER: You have surpassed the expectations of your instructors. Your final record is flawless. With one exception. I see you have applied to Starfleet as well. MICHAEL BURNHAM: From my youth on Vulcan, I was raised to believe that service was my purpose. And I carried that conviction to Starfleet. WORF: I ran away into the mountains. I was without food or water for three days. But there, in the caves of No'Mat, Kahless appeared to me in a vision and told me I would do something no other Klingon had ever done. After I returned to Earth, I pondered the meaning of his words and wondered what lay ahead for me. When I was old enough, I joined Starfleet. DAX: Something no Klingon had ever done. O'BRIEN: When I was seventeen, my father even sent a recorded audition to the Aldeberan Music Academy. JAKE: (perking up) What happened? O'BRIEN: I got in. It was the happiest day of his life. I didn't know how to tell him I didn't want to go. So two days before I was due to leave, I went into town and signed up for Starfleet. SISKO: Why is it so damned important for you to get into Starfleet? Why are you doing this? NOG: Because I don't want to end up like my father [....] I want to do something with my life... something worthwhile. EZRI: I guess I was so busy dreaming of ways to get out of that house... I never saw what was really going on inside it... what was happening to Norvo... the endless humiliations... the constant drumbeat of criticism... the way his heart was carved up into little pieces. I should've seen it. I should've tried to stop it. VARGAS: I can see you've done that before. BASHIR: Too many times. Funny. I joined Starfleet to save lives. MCCOY (VO): With every new place we discover, comes the possibility of new solutions, new possibilities, new cures. It's a funny thing. I thought I'd never leave Mississippi but it was there that I lost my way. It took traveling across the galaxy to find it again. A new sense of purpose. PHLOX: Oh, nonsense. Nonsense. You're too concerned with human morality. I thought you wanted to learn about new cultures. Isn't that why you joined Starfleet? TUCKER: Why, of course it is. But I was brought up believing you don't play around with another man's wife. I don't think I'm ever going to change my mind about that. CHAKOTAY: They'd manage. Palaeontology was always my first love. It's the reason I joined Starfleet. SEVEN: Why didn't you pursue it? TUCKER: I don't get you, T'Pol. I thought you joined Starfleet so you could interact a little more with humans. But it seems to me that ever since we left spacedock, you spend all your free time cooped up in your room reading that bible of yours. PHLOX [OC]: I had meant to transmit this letter by now but the Valakian epidemic has been taking up most of my time. Working with the physicians here has been quite fulfilling. I suppose it's the reason we joined the Interspecies Medical Exchange, but I worry about falsely raising their hopes. KIM: Like me with Starfleet. All my life, that's all I ever wanted to do. TARSES: I used to sit and watch the drills and picture myself an officer. I knew it would make my mother happy. PICARD: But you didn't do it. TARSES: No... I was eighteen, and eager... the last thing I wanted to do was spend four years sitting in classrooms... I wanted to be out there... traveling the stars...I didn't want to wait for anything. ARCHER: Think about it. You'd be the first human to talk to these people. Do you really want someone else to do it? MELORA: I dreamed about exploring the stars as a girl. And I wasn't going to allow any... "handicap," not a chair, not a Cardassian station... to stop me from chasing that dream. STAMETS: I became an astromycologist because of awe. Awe at the miracle of life. I met Straal, and we formed a partnership. We would get to the veins and muscles that hold our galaxies together. We would find truth. And we were happy in our lab, then your war started, and Starfleet co-opted our research. HARREN: I signed on to Voyager because I needed a year of hands-on experience. It was a requirement for getting into the Institute of Cosmology on Orion One. If we hadn't gotten lost in the Delta Quadrant, I'd be there right now. JANEWAY: Sorry to have delayed your career plans, but all of us have had our lives interrupted. That's the nature of space exploration. It's unpredictable. HARREN: Which is why I don't like space exploration. Stumbling from star to star like a, a drunken insect careening toward a light source is not my idea of a dignified existence. Pure theory is all that concerns me. A large number of the crew appear to be 2nd and 3rd generation Starfleet personnel, referred to in Voyager as "Starfleet brats". Tom Paris, Will Riker, Worf, Tuvok, Geordi La Forge, Deanna Troi, Wesley Crusher and Jake Sisko are all examples of those who've been effectively pushed into Starfleet by their parents. Note that Jake, Wesley, Tuvok and Tom all eventually turn their backs on Starfleet when their life choices become incompatible. VALTANE: Well, if you hated it here so much, why'd you join Starfleet in the first place? TUVOK: I joined under pressure from my parents. But I've already decided to resign my commission once this assignment is complete. There is an obvious parallel: Why does anyone volunteer to join an army in the real world? Sometimes, recruits come from backgrounds so impoverished that the armed forces offer the only chance of a steady job and an education, but this is not necessarily the case. The average soldier could make a living in a profession which does not involve being shot at. Much the same goes for police, firefighters, or any other dangerous occupation. So, why do they join? Maybe for the excitement and adventure. Maybe for the chance of serving something bigger than themselves. Maybe out of family tradition. Maybe, hokey though it may sound, out of a sense of patriotic pride and idealism. While mercenaries do exist in the real world, even they typically have some motivation in addition to making money -- probably along the lines of "excitement and adventure". All the money in the world (or galaxy) is not much use if you are killed or permanently disabled in a war zone, so you need some reason to take those risks instead of staying home and becoming an accountant. I am really a bit shocked that the questioner cannot imagine any motivation for a person to risk his or her life, besides big piles of cash. and don't forget "Space: The final frontier". I'm going to throw my 2 cents in here as well. As a former serviceman here in the states I can testify to the validity of the mindset of individuals joining Starfleet. I'll list the reasons and then discuss some afterwards. And yes, these were pretty much all hit on in the comments above. Skill, trade and training opportunities. I'm certain I may have missed a few but these are the stand out reasons, and most are valid for the Star Trek universe as well. Personally, I joined the service for 3 reasons, 1, national pride, I'm proud of my country and I wanted to give back in a way I knew was of value. 2, Familial duty, my father and both grandfathers served and my father saw combat in Vietnam, I felt it was my duty to carry on that legacy. 3, Education, I knew I could get a decent education while serving my country. Not for a second did I consider wealth while serving. In the Star Trek universe the pursuit of wealth and fortune in the realm of the Federation is a distant memory. Since everything someone needs for day to day living is now taken care of, people can focus on experiencing and expanding the human condition. Knowledge, exploration and adventure are the currency of the day. All people who join Starfleet know there is the inherit possibility of death, just as in our modern military. No one joins without this being made abundantly clear long before ink is placed on paper. With that said, the Federation and Starfleet is not by nature, war mongering. They are adventurers, scientists and explorers who only thirst to further those desires. The realities of the Galaxy however, have shown prudence is necessary when encountering other cultures who's goals are counter to that of the Federation. Most starships are exploration vessels first, weapons are strictly considered defensive but are quite capable of being used in an offensive role. Sun Tzu said it best "Invincibility lies in the defense; the possibility of victory in the attack." The Galaxy is full of danger. Just being in space is dangerous enough, let alone crossing paths with most life forms throughout, not just the intelligent kind. It comes with the job and I'm quite certain everyone in Starfleet is very prepared for the realities of their choice. PRESTIGE: For people who value education, the Ph.D. is a source of great prestige, especially among family members. This is similar to the prestige accorded to Starfleet officials in Star Trek, especially when they accomplish a noteworthy feat. LURE OF THE UNKNOWN: You're only going to get your Ph.D. (in any field) if you've done something that has not been done before. It doesn't have to be groundbreaking, like the theory of relativity, but it has to be uncharted territory. The lure of the unknown, the right to claim 'first knowledge' about something is something that drives our species tremendously. What could be possibly more exciting than venturing out into the ultimate unknown, space? We also see some of this passion (for the unknown) in both Captains Sisko and Picard, in terms of their interests in Bajoran technology (see 'Explorers' in Season 3 of DS9) and archeology ('The Chase' in Season 6 of TNG) respectively. Finally, I'm not ashamed of admitting that Star Trek is THE reason why I chose to go into science, and why I will always be a scientist, no matter what the pay. 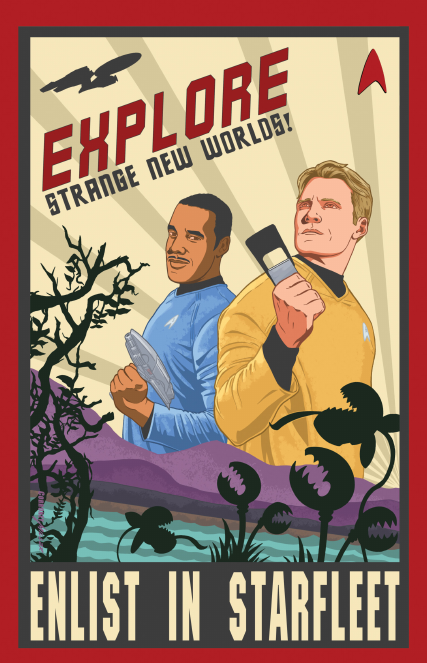 So perhaps science was an equally big lure for those wishing to go into Starfleet as well. Even in the midst of the Dominion War, for example, we see that there are opportunities for conducting groundbreaking science. Imagine, for example, there is a lion attack. If no one is willing to die to defend the tribe from the lion's, all selfishly flee their homes and the tribe is no more - and the lion is full. If, however, all the able-bodied men are willing to die to defend the village, perahsp some of them do... but the lion get's speared, and the village remains. If anything, sign-ups probably flair up in starfleet during the worst times to join! Also, us humans are basically a cancer. We explore everything. It is made clear that the federation has excellent education. They don't appear to just hook up a mind-scanner/filler and teach you everything (although they ostensibly could do this.) They want you to have the experience. They are probably masterful psychiatrists, (manipulators if they wanted to be) and their educational system establishes a pattern of behavior that isn't idle. The United States, for example, scores in the middle of the pack on world-wide standardized testing despite it's large educational budget. So obviously some educational methods are more efficient than others. The Federation's medical/psychiatric knowledge is probably enough to mold children into people who will work for the good of society as much as possible. But it's not even that... graduates from institutions within the federation *simply won't have the habit of being idle! Humans are ultra-social creatures: even among other primates. The holodeck won't fulfill someone unless he was serious problems (or are very passive) - and then we know education in the federation almost has to be compulsory. As such, people will probably be getting out all the time - all the luxuries of the federation don't seemed to be designed to be as addictive as T.V. Who says there are no rewards? It's doubtful that even the federation will take anyone who wants to see one to hundreds of planets. The enterprise will "drop you off at the nearest starbase", but it's doubtful there are federation star-ships that are in the mood to go any further out of their way for you than that! You'd have to at least get a civilian job to be near all the cool stuff. Besides the captain still gets bigger quarters. Remember, "post-scarcity" does not mean "infinitude." - it's possible that there are material benifits to serving the federation, aside from the glory of being a stellar explorer! Look at 10-forward. Then look at some of the seedier ships/bars we've seen during the episodes... there are plenty of personalities that would take 10-forward any day. Want to belong to something "bigger than themselves" or something "with meaning"
For years I've worked with the military and frankly they work on some really cool $h1t and found that work professionally (but not financially) rewarding. So perhaps a desire to work with cool $h1t. My brother is a psychologist who treated returning vets. He determined that he could do more good if he could treat servicemen sooner - in theater. So at the age of 42 he joined the military and promptly got deployed to Afghanistan. He had already been serving others - but he felt he could serve them better if he was part of the military. This fits very well with the Star Fleet ethos. Frankly, the number of reasons someone might join are probably proportional to the number of people qualified to join. I imagine one of the purposes of the psych tests that are part of the admissions process are to determine the applicants motivations. I think they get paid in "credits" or at least they were in the original series era. I'm guessing they join up for the adventure, and for the experiences it could give them in later civilian life like today's military (not to mention the space babes). But then again Starfleet is not primarily a military organization although it often acts like one. It's like a combination of NASA and the US Navy, with exploration being the main mission. "The Doomsday Machine" (in reply to Scotty declaring that he's got one of the Constellation's phaser banks recharged): "you just earned your pay for the week". These suggest that money of some denomination is still in use. Kirk's remark in "The Doomsday Machine" could be taken as mere figure of speech to recognize Scotty's efforts, but there's no reason to believe such figure of speech would survive into a post-scarcity economy. Kirk's question to Spock is obviously rhetorical (which Spock takes literally), but the fact that he could offer a literal answer says that a literal answer in fact exists, which means money exists. As for Starfleet service being a dangerous occupation... well, sort-of. Going out into space to fight a war doesn't mean "home" is any safer. Not venturing out to fight could (and often seems to) mean the enemy brings the fight to your doorstep. Venturing into strange space anomalies can be a bit dangerous too, but then countless other occupations could come with hazards of their own. Although it might seem somewhat dangerous to be in the military, the truth is that it is not dangerous. Well, most of the time soldiers, even front line, are not in battle. Think of US soldiers in Germany, Korea, etc. Even in a hot war, 99% are not wounded or killed. So the dangers are exaggerated. So people join the military for the same reasons that they take any job. And anyway, we are all now on the “front lines” with all this terrorism. No one is really “safe” anymore. In the movies—especially Star Trek—the plot is written to show as much action and drama as possible. In a “real life” Star Trek the life of the average joe/jane would be safe and boring. Just like the U.S. Navy. Not the answer you're looking for? Browse other questions tagged star-trek star-trek-dominion or ask your own question. Why did Reginald Barclay join Starfleet when he can play the Holodeck all year round as a loafer? What race was supposed to be what people? Why didn't Sisko et al. check Lisa's numbers?